I'm frequently Googling to find out about the sizes of fasteners. This is frequently a part of measuing something during reverse engineering. It would be easier if I had a page with the information I need in one place so here it is. The # corresponds approximatley to the clearance hole diameter measured in 1/32". For example a #4 screw clears a 4/32" I.D. or 0.125" hole. This fails for a #12. "The base is #0 at .060 in. The size increments are found by adding .060 + (.013 x the identifying number). Size #4 is .060 plus (.013 x 4 = .052) or .112. Size #14 is .060 + (.013 x 14 = .182) or .242. The base number is 0 with a rod diameter os 0.060". Each number increment from there adds 0.013". No. 4 rod dia. thus equals 0.060 + 4 * 0.013 = 0.112". No. 14 rod dia. thus equals 0.060 + 14 * 0.013 = 0.242"
Warning There may be one or more errors in the following table! When starting to remove a (+) type screw it's not clear to me if it's a Torx, Phillips or Pozidrive or which size it is. So it's easy to try different bits (without putting the bit into the handle, just the raw bit) to see which fits the tightest. Using the correct bit makes it much easier to remove the screw and does no damage to the screw head. This is a head designed by the Phillips screw company so that it does NOT cam out (Wiki). Torx screw heads are designed so that they do NOT cam out (Wiki) and must be installed with either a torque limiting powered screwdriver or by hand. They replaced Phillips heads for factory installation because of the saving associated with longer bit life. The T10 is very common on HP (Agilent) equipment. Phillips screw heads are designed so that when installed with a power screwdriver that has no torque limiting the driver bit will cam out (Wiki) to limit the applied torque. This was a long time ago before torque limiting screwdrivers existed. Machinery's Handbook has the head size information. But for the (+) type heads there's a short paragraph saying they are the same as the slotted (-) heads. The eyelet is very similar to a rivet except the eyelet has a hole all the way through. Eyelets are typically made of brass. Eyelets are much easier to set than rivets. My first exposure to them was making double sided printed circuit boards at a time prior to vias so eyelets were installed to make an electrical connection between the top and bottom layers. They were installed by a pneumatic powered machine that had auto feed and a foot pedal to activate the setting operation. The machine came from a shoe manufacturing operation. A Grommet is similar but is used with a washer, typically in fabric. For example the corners of a tarp may have grommets to allow using ropes to hold it. This is tooling that allows using the press function of a Drill Press (not the drill motor) to set eyelets. 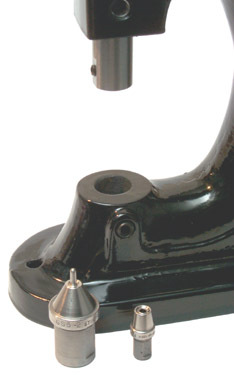 The top tool has a central cone to flare out the eyelet's open end and then a radiused part to form the reverse bend. The bottom tool holder has 3/8-16 threads that match the T-slot fittings for this bench top drill press and so an Enco flanged nut (407-5024) with it's points ground very slightly makes a good centered fit into the top drill press table center hole. All that's required to line up the top and bottom tools is to rotate the table left or right a little and then clamp it. The bottom tool holder appears to have been made from a bolt that has two concentric holes drilled on the long axis. The upper hole is about 1/4" diameter and holds the bottom anvil. The retractable pin sticking up in the center fits inside the shank of the eyelet, but it too big to clear the small lip at the end of the eyelet thus it will lift up an eyelet that's shorter than it's height above the anvil. The lower hole clears the coil spring. That a very handy thing helping to insert the eyelet into the work piece. Below the retractable pin is a spring pushing it up. If you try to form an eyelet without a pin inside the eyelet body, the body will crumple instead of holding it's shape. Another way to get the needed internal support is to make the top tool with a fixed pin that will go into the hole in the anvil. Eyelets are available in many diameters and lengths. The nominal diameter of the hole is how the diameter is specified and the ones I'm using are 3/32, 1/8 and 5/32". 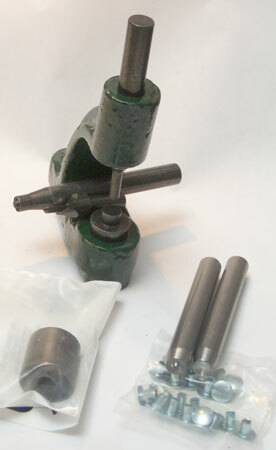 The 3/32" tooling is shown in the photo. In order for the top tool to fit inside the snaps used for 9 Volt batteries the diameter has been reduced from what a stock top tool looks like. This was done with the tool in the drill press with the motor running using a hand held grinding stone. The top tool is installed in the chuck with it's top end seated on the inside of the chuck so when downward pressure is applied the tool will not slip in the chuck jaws. It takes some force to seat an eyelet, but not by any means excessive. In the above photo the bottom tool is located in the center hole of the movable table. In the photo at the left the bottom tool (including the pin and spring) are located in a custom offset holder made from 1" x 1/2" iron bar. in the end of the bar there's a 6-32 tapped hole for a pinch screw. That stock round head screw does not work because it does not let the center of the bottom tool get to the center position of a AA battery in the battery holder. 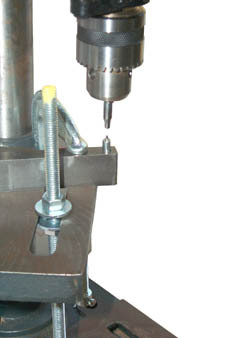 The movable drill press table can be tilted left to right and when pressure is applied to seat an eyelet the table tips to the right no matter how tight the locking nut is tightened. The fix for that is to install a one foot long 3/8-16 all thread rod, four nuts and four washers to lock the distance between the drill press base and the table. The Siska tooling uses a system that does not need a receding center pin. Their bottom tool does the eyelet forming unlike the Keystone tooling where the top die does the forming. 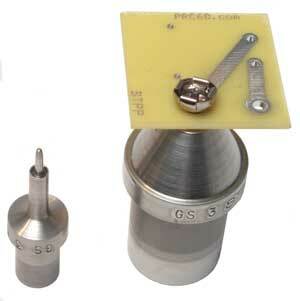 The Siska top tool has a center clearance hole and the bottom die has a fixed pin. The top and bottom dies fit a 3/8" diameter hole in either this manual tool holder set or into the arbor press or more automated machines. The shank diameter is very important since it needs to clear whatever is near the eyelet. A locating point is shown on a bottom tool that makes a scored setting. I prefer the roll setting where the lower die would have a half doughnut around the center pin. The next step up from hand tooling is an arbor press. They come in 1/2, 1 and 2 ton capacities. The key advantage I see is that the alignment between the top and bottom tools is much better. When using a lower die with a cutting point (just a square top with sharp corners), it's important that the top and bottom dies are well aligned. The two adjusting screws on the front would allow minimizing front to back slop in the ram. Don't know about side to side slop. 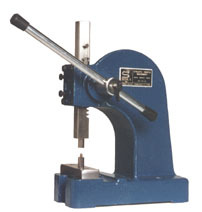 I debated getting an arbor press, the Stimpson 405 press or tooling for using a hammer. The fancier auto feed presses are what I used long ago to install shoe eyelets into printed circuit boards to make vias (after soldering each on both sides), but those presses are too expensive for me. So got the 405 press with compound linkage and some customized tooling as well as some of the stock eyelet tooling. The arbor press is a simple rack and pinion machine where the mechanical advantage is the operating arm length (minus a little) divided by the pinion gear radius. This works out to around 10 and the ratio is the same for all positions of the arm. The Stimpson 405 has a three bar linkage and it's mechanical advantage changes with arm position. It approaches infinity at bottom dead center. I estimate it at 100 but it's very dependent on how close to going over center the tooling allows. Needless to say this makes a huge difference in ease of use and it's something I didn't know until I had the press. It would be better to have an adjustable lower tool so that you could optimize the leverage to match the thickness of the work. This is the current version (22 Apr 2008) 405 made from an aluminum casting. It's impressive to look at with a mirror like black finish, i.e. anything in the photos that looks like a blemish is a reflection. The action is smooth and feels precise, but the proof is in the pudding. The top and bottom tools use different mating diameters. The bottom tool is 13/16" and the top too is 3/8". Keystone and Siska use 3/8" for both tools thus allowing you to install them either way. Stimpson seems to want you to only install them one way. The bottom tool requires a 3/16" hex wrench and the top tool a 1/8" hex wrench. Both tools have flats for the setscrews and a close fit to the tool. 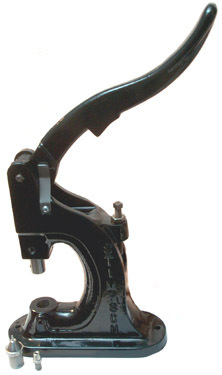 If you are left handed then the press should be mounted as shown in the photo at left above. That way you work the press with your off hand while your precision hand is used to work with the eyelets. If mounted with the handle facing back you would need long arms to work it. In addition to the eyelet tools the 405 also can be used with Grommet tools and also round sheet metal punches in the size range of 3/32 to 3/4" diameters. This is a custom tool made to install 9 Volt battery snaps. 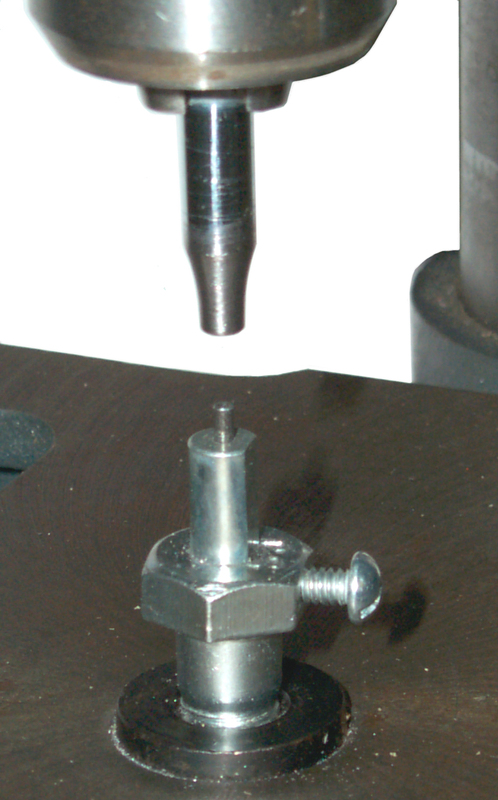 The post in the center of the snap is spring loaded and gets pressed down by the top tool which is shown to the left upside down. 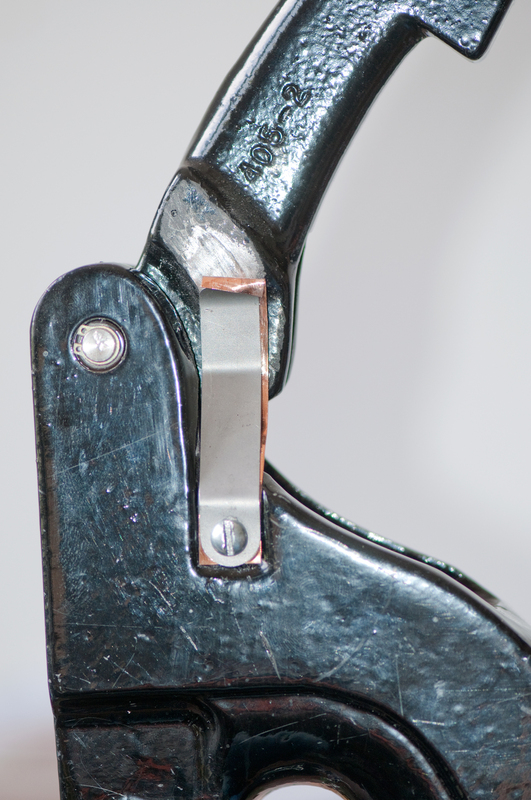 The spring loaded post holds an eyelet, the PCB and keeps the snap in place until the top tool sets the eyelet. This is upside down from the stock tooling shown above but is the correct way to manually do eyelets. The GS (Graduated Size) system is based on 1/32" So a GS-5 tool is for use on eyelets that go into a 5/32" (0.156") hole. The smallest GS series that's mentioned in the Stimson catalog is GS 2-2 (1/16 dia hole x 1/16 long under flange) and the largest GS 7-14 ( 7/16 dia hole x 7/8" long under flange). I suspect there's some logical way the flange diameter is determined but have not tried to analyze it yet. The Keystone two digit eyelet numbers are the GS numbers. It turns out the stock tooling would work for installing an eyelet into something thin and flat, but not into real world applications. Custom tooling is needed. A very close tolerance fit is used between the tools and the press. If an operator that's not mechanically inclined changes the tools and does not seat the set screw on the tool's flat, then the precision surface of the tool gets distorted thus locking the tool into the press. 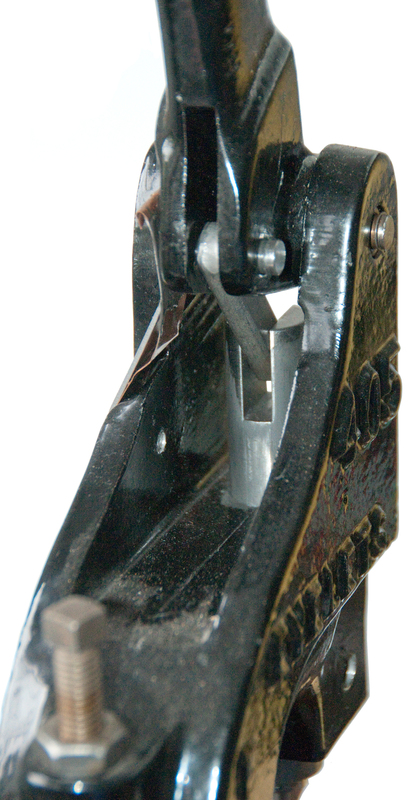 There are a couple of notches in the tools that allow a wedge to be driven between the press and tool to get it out. Then the tool needs to be cleaned up. There is a finger shaped metal strap that presses against the hand lever so that when the lever is up it will stay there. The problem is the metal of the strap (steel) is very similar to the metal of the hand lever (cast iron) and so there is galling. Along with the galling, and the main reason for the "fix" is the very loud noise that's much worse than fingernails on a blackboard. The fix from idea to working took about 10 minutes. Just cut a strip of Phosphor Bronze sheet metal a little wider than the finger, drill a hole for the mounting screw and put it between the two. Later an upside down "U" was added to the Phosphor Bronze to keep it from getting pulled down. A normal rivet is a solid part, but the tubular rivet has a hole in the end that's going to be formed so that end looks very much like an eyelet. It's a lot easier to form the tube than the rod. These are some rivets and rivet tools from Mike's "A" Ford-able Parts. I get the feeling the Model A was held together by rivets (not sure of the factory used tubular or solid ones. 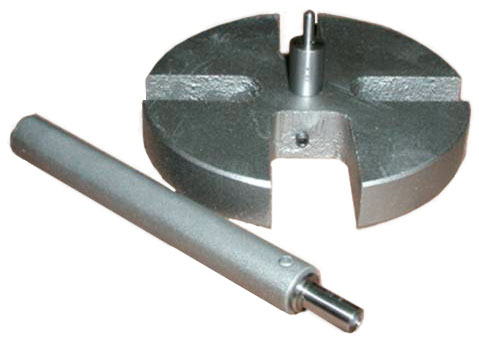 The tool holder and associated tools is the T2018 Brake Riveting Tool Set. The tool bore is 3/8" for the top and bottom and the holes go all the way though the top and bottom of the holder. The top bore has a wire type snap ring that's holding the top tool keeping it from falling. The set is for use with the A2018R Brake Lining Tube Rivets. In the lower right of the photo is the A16753 Hood Handle & Latch Clip rivets and the RA2022 tools for setting them. These tools have a shank diameter that's just under 3/8" and they fit the above tool holder very well. The rivet has a head diameter of 0.314" and a shank dia. of 0.1405 (tight fit in #28 drill hole). The shank is 0.189" long before being formed so the thickness of the parts being riveted together needs to be under 0.1". The T2013T tool in the lower left is to be used with the A2013 rivets, but I can't find them on Mike's web pages.